(Jonesboro, AR) - Graduation season is upon us, and Ritter Communications is proud to provide coverage of several ceremonies in our service areas. The schedule kicks off with a live broadcast of today’s Arkansas Northeast College graduation at 2 p.m.
Tubetown, Ritter’s local content and coverage channel, will carry the graduation ceremonies of seven schools – four in Northeast Arkansas (Tubetown channel 21) and three in West Tennessee (Tubetown channel 11) for Ritter cable TV subscribers. 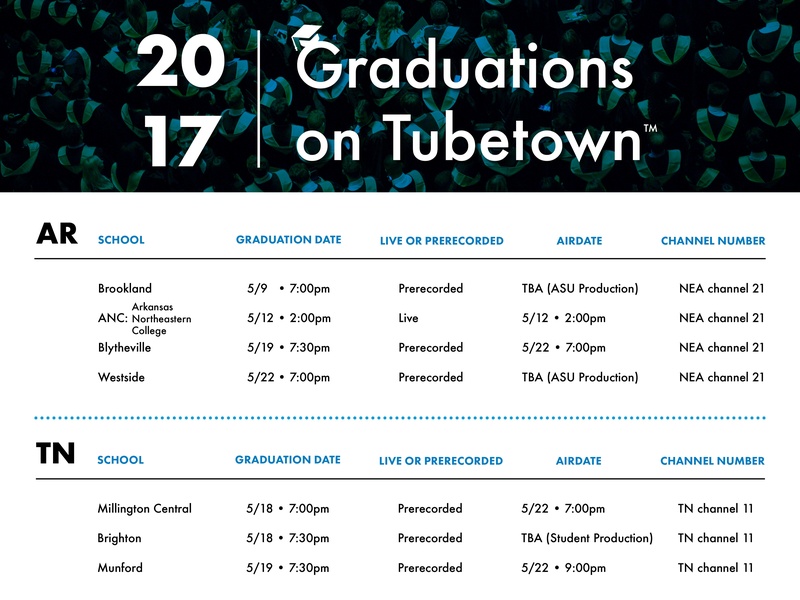 The ceremonies will also be available on TubetownOnline.com after their original airing. Tubetown, the local content and coverage channel of Ritter Communications, airs live and pre-recorded high school sports, as well as local events, parades, charities and pageants. Tubetown was established in 2008 and reaches over 13,000 Ritter TV subscribers in Arkansas, Tennessee and Missouri. Tubetown airs on channel 21 in Northeast Arkansas/Southeast Missouri. Visit Tubetownonline.com on the web and receive programming updates via our Twitter account, @Tubetown. Ritter Communications, founded in Marked Tree, Arkansas and headquartered in Jonesboro, began providing local phone service in 1906. Today, Ritter serves 62 communities and more than 45,000 customers in northeast and north central Arkansas, southeast Missouri, as well as, west Tennessee with advanced voice and data services typically found only in major metropolitan areas. Ritter invests heavily in the communities it serves by deploying proven, best-in-class infrastructure and technology while coupling it with a world-class customer focused experience.